Guys, do you remember Mankati is going to build a brand new 3D Printing Exhibition area for Shanghai Science and Technology Museum? Sorry to tell you this late! 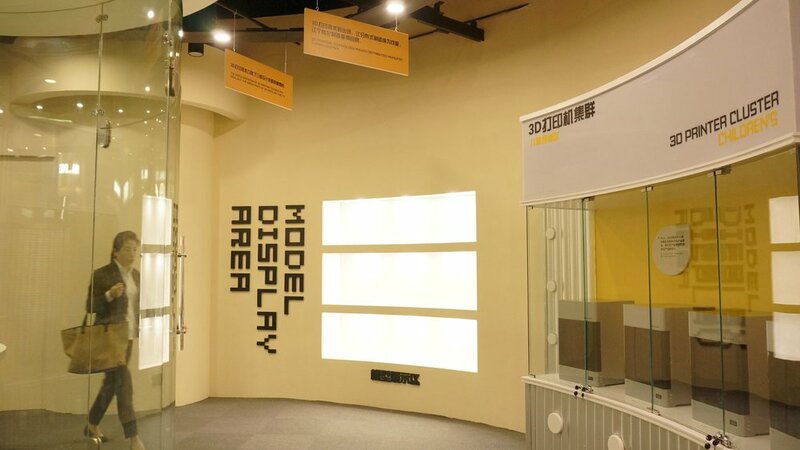 Shanghai Science and Technology Museum has already open the “3D Printing World” Exhibition area to the public. This new “3D Printing World” consists of 3 parts: 3D Printing Maker Classroom, 3D Printing Dream Factory, and 3D Printing Workshop. This classroom is arranged to give CAD lessons. All the course contents are made on the basis of STEAM concept. Besides, Mankati empowers the lecturer by installing a class management software which is capable of collecting assignments and evaluating them with ease. And it is a round classroom, thus the interaction between the teacher and students can be enlarged. Mankati also decorate this classroom this 3 huge screens, 3 pairs of sound tracks and warm bright light. 1. When students finish their assignments in the CAD classroom, they can send their CAD design through the intranet to this 3D printer cluster to print them out. 2. Showing to the public that a 3D printer cluster can be seen as a factory that produce end-use parts directly without any manual intervention. And thus inspire people to learn and use 3D printing technology. Firstly, E180 has a mature and stable control and mechanical system, which makes it easy to use and maintain. It is a ready-to-use machine. Secondly, Mankati develops its own slicing management software. Users can send tasks to E180 remotely through the intranet and monitor the printing process. There is also a cluster management function in this software that enable the users to control multiple E180s all by oneself. Last but not the least, Mankati E180 can work with high performance materials. Now people in education field require stronger materials than PLA or ABS. E180 can fulfill their requests. 3D printing pens and 3D scanners are provided here. Parents and their children will have fan drawing 3D painting in this workshop. 3D scanning is an important part of reverse engineering. The processes of using 3D scanner are showcased here as well. This whole new “3D Printing World” of Shanghai Science and Technology Museum welcome people from all over the world to visit. Now Volkswagen FAW Engine Company is getting started working with 3D printer. And Mankati E180 3D Printer becomes their choice.